With its long winding highways, near-perfect weather and chilled vibes, nothing says “road trip” quite like California. And where better to begin your exploration of the Sunshine State than with a drive along its sparkling coast? Home to golden sands and sea breezes, chic towns and laid-back beach resorts, surf culture, spectacular nature reserves, and so much more, California's Pacific Coast is most quintessential and stunning. Anchored on either side by two urban gems – San Francisco to the north and San Diego to the south - and punctuated by the unmistakable charisma of Los Angeles roughly mid-way, this coast-hugging route promises the drive of a lifetime. This hilly city is located on a slender peninsula along the Northern Californian coast and forms the perfect gateway to launch your epic road trip. San Francisco is defined by its quirky architecture, progressive values and unquenchable spirit of innovation. It’s a tightly knit patchwork of unique neighbourhoods, each one boasting its own distinct feel, whether you head to trendy Mission, authentic Chinatown or bustling Union Square. For the archetypal San Francisco, make your way up any number of steeply rising downtown streets leading into quaint residential areas lined with colourful Victorian buildings, serviced by historic cable cars and boasting stunning panoramas over the bay, especially from the must-visit Telegraph Hill. You can see the best of the city in a day, but to really make the most of everything on offer consider lingering a little longer. 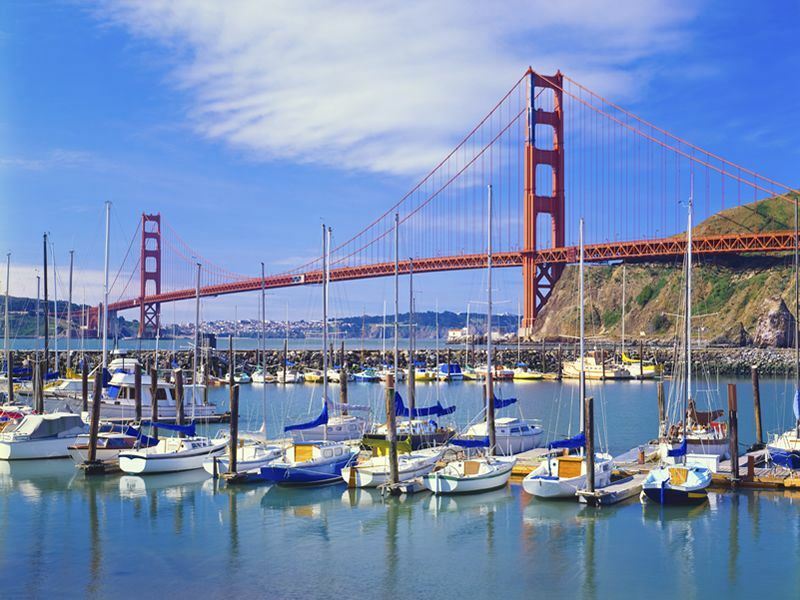 Stand-out attractions include Lombard Street, The Presidio, Fisherman’s Wharf, the notorious Alcatraz Island and of course the iconic Golden Gate Bridge. There are numerous places to get wonderful perspectives on this awe-inspiring landmark, with some of the most dramatic views and photo opportunities to be had in foggy weather. Get up close on a boat cruise of the bay and be sure to drive, cycle or walk across the bridge itself. The city is a hot-bed of culture and art, with a thriving literary scene, vibrant mainstream and underground music venues, bookstores, galleries, museums and film festivals galore, and of course it’s the global hub for all things tech. The food is truly world-class, especially when it comes to locavore eateries, farmer’s markets and food trucks, as is the shopping and nightlife. And if you need to recoup, there’s plenty of recreational opportunities to be had, from strolling through leafy parks to lounging on a bay side beach. With time to spare, escape to nature for the day with a visit to the spectacular Point Reyes National Seashore, home to wild beaches, thundering ocean surf and rocky headlands, as well as a rich ecological and cultural heritage. 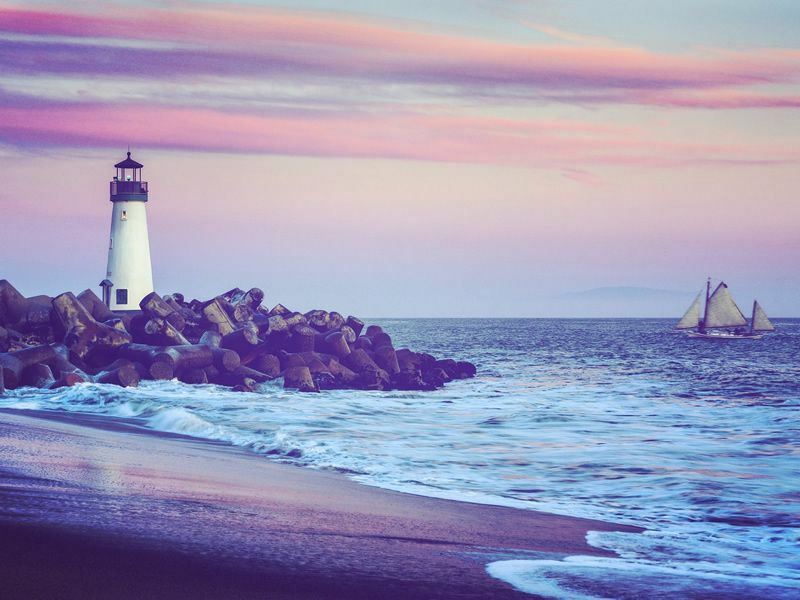 Drive 75 miles south of San Francisco and you’ll arrive at Santa Cruz, a classic Californian beach town framed by the Pacific Ocean on one side and a magnificent backdrop of thickly forested mountains on the other. Renowned for its easygoing, hippie ambience, liberal politics and counterculture values, it’s home to a diverse population and forms an interesting contrast to the more sophisticated resorts a little further down the coast. Santa Cruz is famed for its surfing; in fact this is where the wildly popular sport was first introduced in California. The tradition is certainly kept alive and well today, alongside plenty more watery thrills such as stand-up paddle boarding, kayaking, wakeboarding and kitesurfing. The revitalised downtown area, especially along Pacific Avenue, features an inspiring collection of boutiques, eateries and entertainment options. The presence of a University of California Campus ensures a hip, youthful vibe and you’ll encounter endless places to browse for unique vintage wares or indulge in delicious organic locally-sourced food. Plan to spend at least half a day here, relaxing on the waterfront, enjoying the famous amusement-filled beach boardwalk and simply taking time to absorb the diverse local life and chilled ambience. With longer to spare, there are some fantastic state parks to explore nearby, as well as opportunities for fishing expeditions and whale-watching excursions. The Monterey Bay region is decidedly upmarket, yet pervaded with a calm atmosphere that makes it ideal for those in search of a relaxing retreat away from some of the state’s more vibrant destinations. Start this section of your trip with an exploration of historic Monterey, brimming with fine adobe architecture, quality museums and buckets of Californian charm. Be sure not to miss the atmospheric Fisherman’s Wharf, home to sealions, speciality shops and seafood eateries (sampling the classic chowder is a must). Also well worth a visit is the world-famous Monterey Bay Aquarium which is backed by an expansive marine sanctuary protecting dense kelp forests and thriving populations of otters, dolphins and whales. Make your way along the 17-mile coast-hugging route around the peninsula to reach Carmel, passing quaint towns, grand mansions, sweeping vineyards and iconic Monterey cypress trees along the way. Once in Carmel, explore the fascinating history and architecture of this former Spanish mission settlement. Nature lovers will also feel right at home – besides the wild beaches, there are several nature reserves criss-crossed with excellent hiking trails leading out to lookout points with phenomenal views. Meanwhile, the main village itself exhibits a distinctly European-feel and features galleries, boutiques, artisan workshops and cosy gastro-pubs galore. 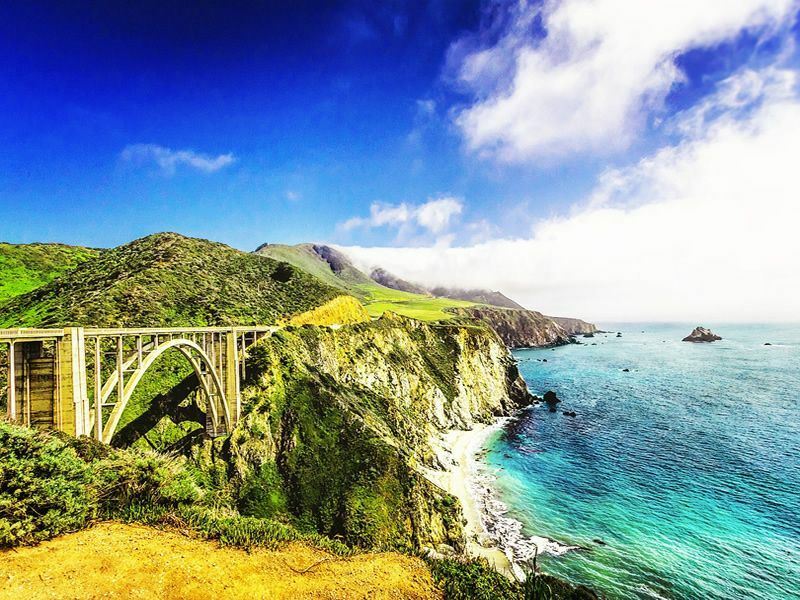 South of Carmel, be sure to join State Route One, more commonly known as the Pacific Coast Highway, for one of the most scenic drives in the US, if not the world. The highlight is undoubtedly crossing the colossal Bixby Bridge to reach the breathtaking Big Sur coastline, defined by craggy cliffs, crashing surf and astounding lookout points, extending all the way south to San Luis Obispo. This is arguably the most remarkable stretch on the entire Californian coast, a perfect blend of raw beauty and arty bohemian communities that invite you to slow right down. Don’t miss the impressive redwood forests in Pfeiffer Big Sur State Park, nor the equally spectacular beach nearby. 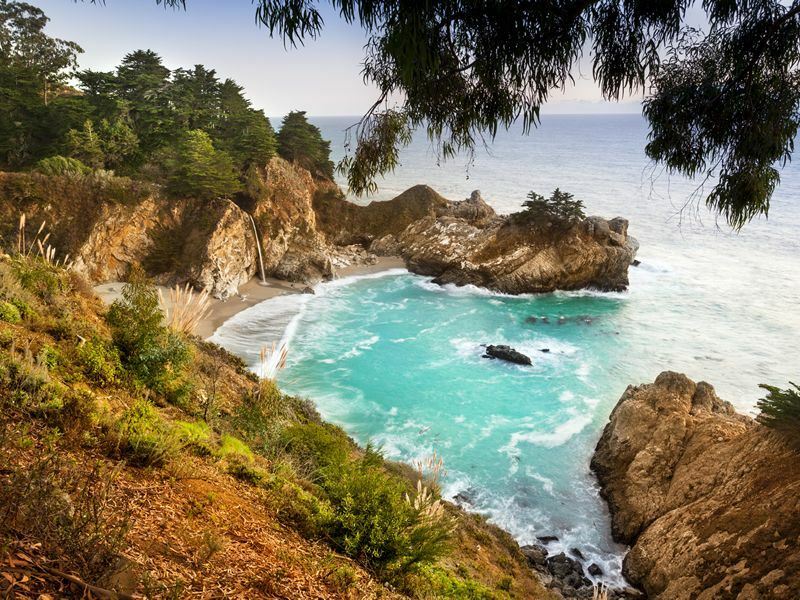 Marvel at the McWay Falls and the wild Ragged Point and treat yourself to a rejuvenating soak in the clifftop hot springs at the Esalen Institute. You can drive through in a day, but it pays to take an unhurried approach, perhaps taking time to explore some of the wild and remote protected parks and forests a little inland. A 90-minute drive south and you’ll arrive at Santa Barbara, a fine introduction to SoCal. 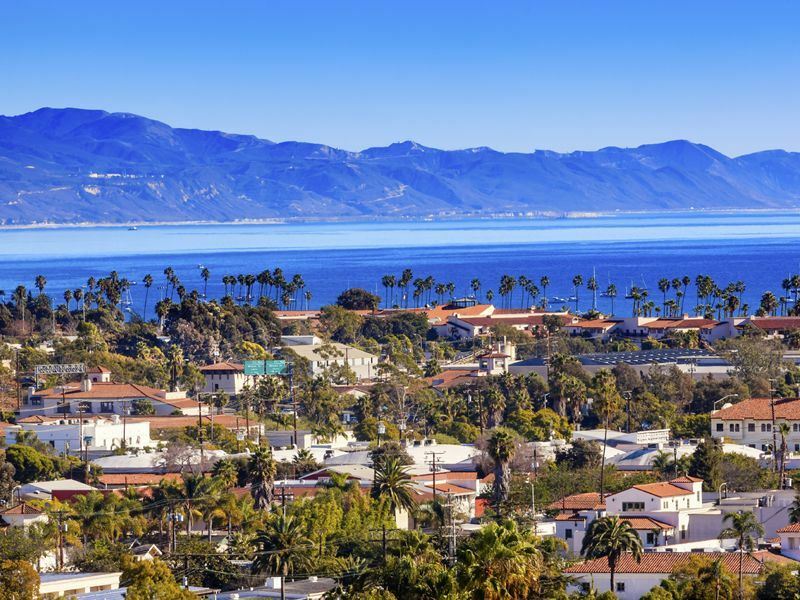 Dubbed the American Riviera, the town is famed for its star-studded palm-lined beach and vibrant waterfront brimming with fancy boutiques, fine restaurants and watersports outlets. There’s something here for the entire family, from the splendid zoo, botanic garden and parks, perfect for kids, to the excellent cultural venues, shopping and nightlife for the grown-ups. Boasting an unmistakable Mediterranean feel with its Spanish Revival buildings, beautiful boulevards and floral scented walkways, it’s a great place for exploring on foot and at leisure. If you have a day to spare, head for Santa Barbara’s splendid wine country, explore the wild backcountry of the Los Padres National Forest or enjoy a day of adventure in the remote Channel Islands National Park a little further down the coast. Welcome to L.A. County! For those coming from the north, there’s plenty to discover before diving headfirst into the urban buzz of Los Angeles itself. The area of coast just to the west is known as the Pacific Palisades, an achingly beautiful stretch of shoreline harbouring an endless string of sandy beaches, spectacular cliffs and rocky headlands boasting stunning ocean vistas. 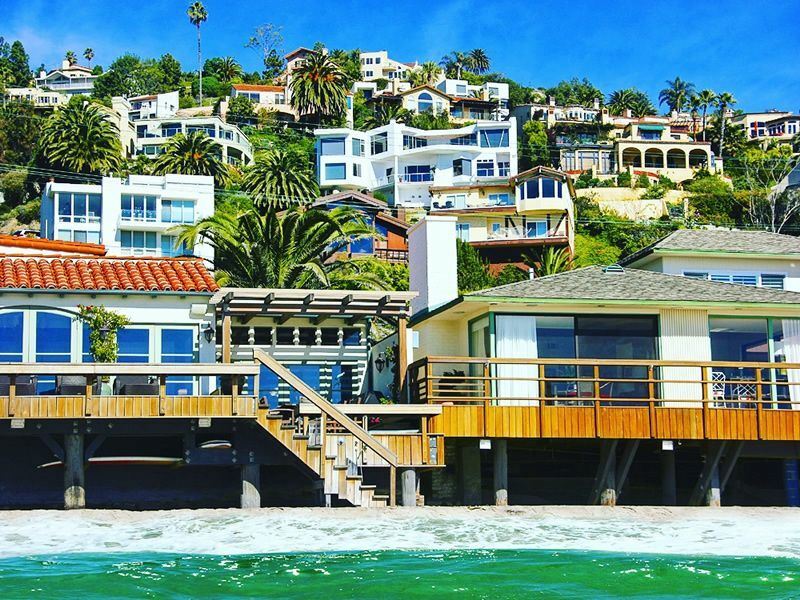 Malibu is an especially affluent hotspot, a favourite hideaway for A-list celebrities whose glamorous homes can be spotted along the 23 mile stretch of picture-perfect beach. Malibu is also a popular surf destination, but there are ample opportunities for enjoying nature inland as well in the numerous state parks. Hike, bike or horseback ride along wooded trails leading up through coastal mountains to awe-inspiring lookout points. Drive roughly twenty miles south of Malibu, and you’ll arrive at Santa Monica, the ideal Californian beach destination, offering visitors white sands, warm waters, relentless sunshine and an infectious mellow vibe. And yet it’s also within easy striking distance of L.A. and its endless urban thrills, whilst boasting plenty of worthwhile diversions itself. Make the most of the perfect weather and gorgeous surrounds by topping up your tan at the beach, splashing around in the water or simply strolling the picturesque streets or the famous pier and soaking in the relaxed ambience. Santa Monica is home to a thriving arts and culture scene, with copious galleries, museums and public installations and there’s also a fantastic array of shopping, dining and nightlife to explore, especially along the bustling Third Promenade. L.A. is famed for its glitz, glamour and somewhat plastic façade, and of course there’s plenty of fun to be had in exploring the world of the rich and famous. But dig a little deeper and you’ll find a city that boasts a unique edge, unbridled creativity and diverse culture, along with areas of striking architectural and natural beauty. There’s so much to see and do we suggest reserving at least two full days to explore the highlights, and more if you can. Stop by Universal Studios for a fascinating and fun-filled insight into the city’s world-dominating movie industry. Head over to Hollywood to admire the Walk of Fame and while you’re here, catch a show at the Dolby Theatre, where the Oscars are held annually. Deluxe window shopping along Rodeo Drive, admiring the Hollywood sign, partying the night away on Sunset Strip – these are all classic – if cliched - L.A. experiences that should not be missed. 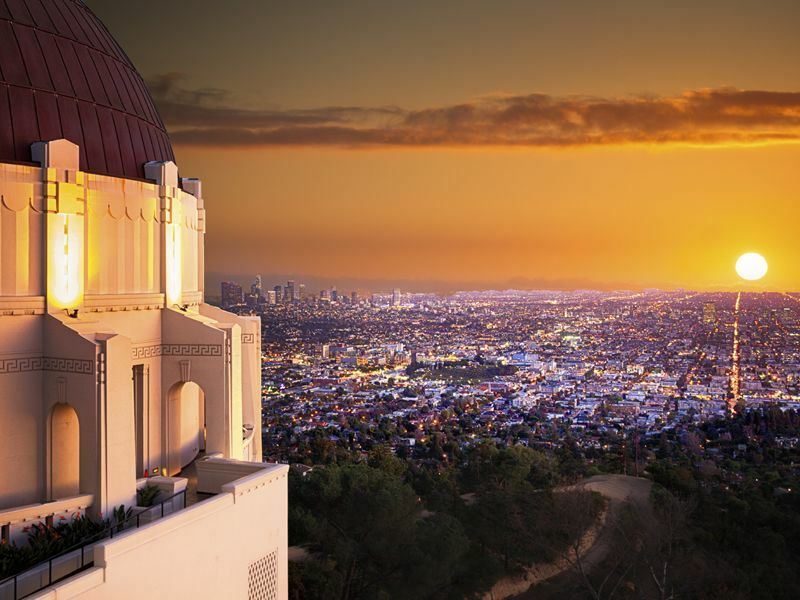 Once you’ve toured the tourist hot spots, head to Griffith Observatory for a stunning view of the downtown skyline, tour the world-class Getty Art Museum or strike out on any number of accessible hikes up into the beautiful hills surrounding the city. 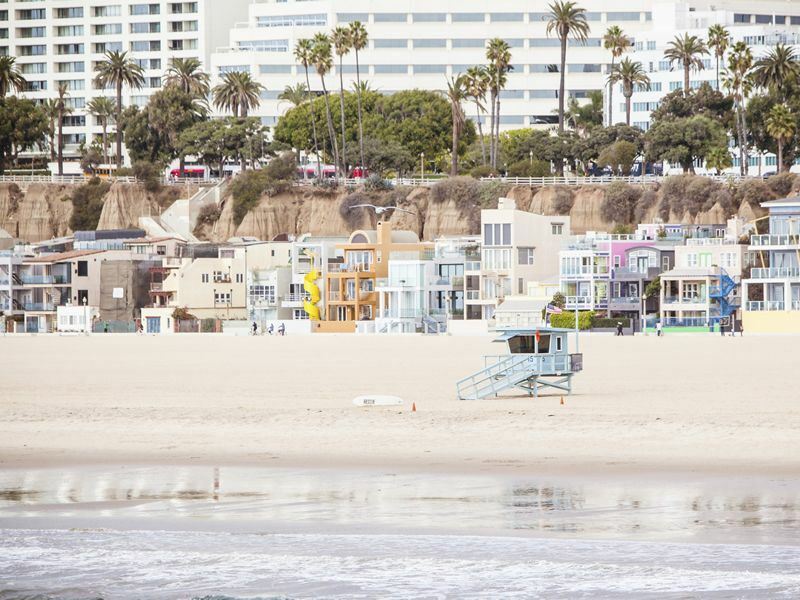 Venice Beach is another must, a vibrant coastal neighbourhood dedicated to displaying California at its most eccentric. Base yourself around the iconic Ocean Front Walk and simply take it all in – the skaters, rollerbladers, body-builders, street artists, performers and any number of weird and wonderful characters. Beyond all this, there are galleries, museums, bookstores and every kind of shop imaginable peppered across the city. And the entertainment is simply non-stop – from theatre to clubs, cocktail lounges to concerts, L.A.’s nightlife is second to none. If you have some time on your hands, take the 60-minute ferry ride over to Santa Catalina Island. A short hop from the madness of the mainland, and yet one of California’s best-kept secrets, this island delights the senses and invigorates the soul. The main community of Avalon is brimming with delightful seafood restaurants, interesting boutiques and romantic hideouts. There are miles of breath-taking mountains, canyons, coves and beaches to explore, much of it protected and refreshingly undeveloped, and all of it an unbeatable natural playground for hikers, bikers and water sports enthusiasts. Just before reaching San Diego, roughly 120 miles south of L.A., the Pacific Coast Highway winds its way through the lovely Orange County. It’s well worth making a stop at San Clemente, a laid-back surf city filled with impressive Spanish colonial style architecture. The year-round swells attract some of the best surfers around, along with associated assortments of skate and surf stores, T-shirt shops, diners and delis, and even a dedicated Surfing Heritage and Culture Center. The downtown district is one of the most attractive around, filled with quirky boutiques, mouth-wateringly good eateries and fun bars. Half a day is enough to get to grips with San Clemente’s old-style charm, but if you’ve got the time it’s well worth lingering in the area. The town makes a great base for exploring more of OC – including the popular resorts of Newport Beach, Huntington Beach and Laguna with their glorious beaches, fun-filled amusement parks, and beautiful wilderness areas. Those with kids will also want to make a stop a little further south at Carlsbad, home to Legoland, along with yet another fantastic beach and a wonderful selection of shopping and dining options. Often overshadowed by the likes of L.A. or San Fran, but packed with a wealth of incredible sights and activities, it’s well worth spending at least a couple of days to uncover the undeniable charms of this friendly sun-filled city. 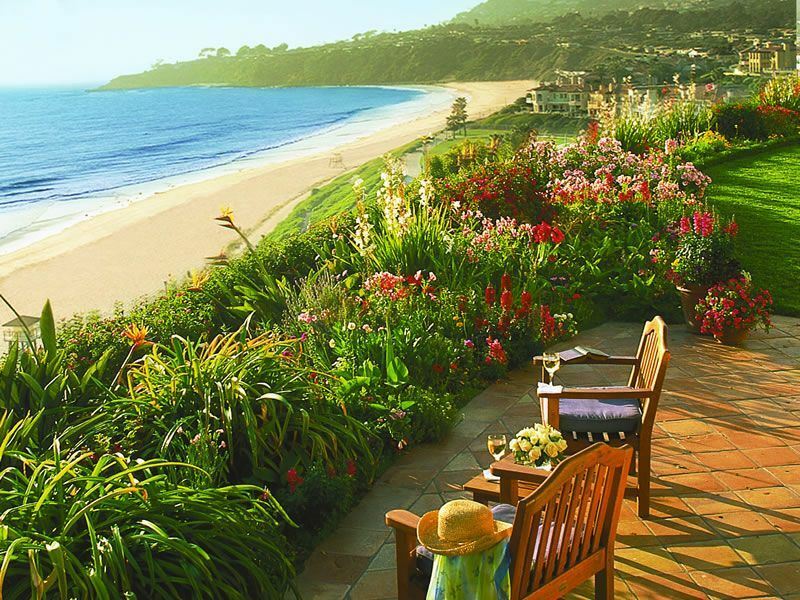 The near-perfect weather means that relaxed outdoor living prevails, and even though this is America’s eight largest city, San Diego often feels more like a collection of beach resorts or villages, each with their own distinct but notably laid-back feel. Make the most of the white sandy beaches (there are more than sixty of them) that are perfect for lounging or getting active with any number of watersports, surfing being the most popular. 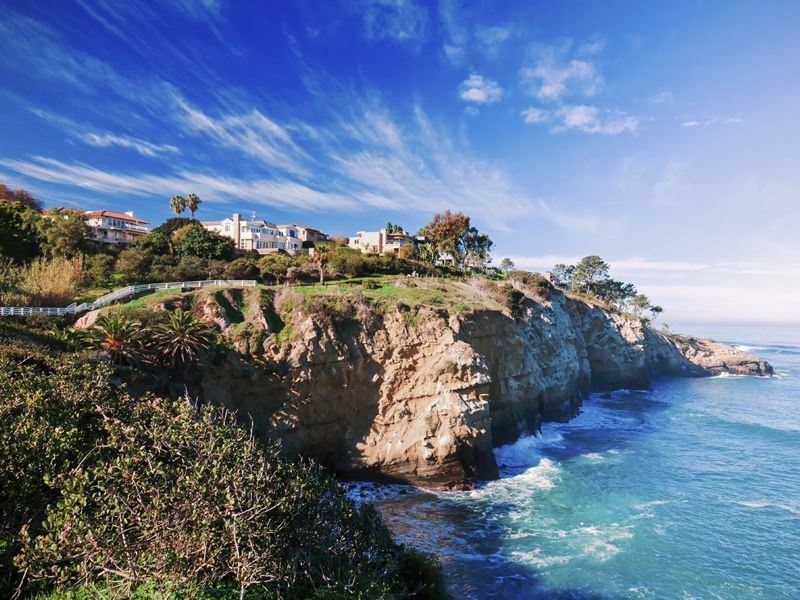 For stunning scenery and a taste of the good life head to affluent La Jolla, a district which occupies a breath-taking hillside setting just north of the city overlooking miles of pristine Pacific coastline. This is the place to indulge in fine dining or hit the designer shops, all in gorgeous chic surrounds. Alternatively, head out to Coronado Beach – one of the best on the entire West Coast for surfing, kayaking, eating, drinking and general festivities. Not-to-be-missed attractions within the city itself include the renowned San Diego Zoo, harbouring incredible wildlife and beautifully landscaped grounds, as well as Sea World, the world’s largest park dedicated to marine life – both great options for families. Then there’s Balboa Park, packed with must-see museums, manicured gardens, sport complexes and exciting eateries. Meanwhile, the vibrant downtown and patchwork of diverse neighbourhoods will delight any foodie, culture lover or thrill seeker, brimming with progressive art galleries, gourmet restaurants, artisanal breweries and so much more. Why not extend your exploration of the splendid Sunshine State by heading inland to discover some of America’s most remarkable national parks? From Yosemite to Sequoia, along with Death Valley and Grand Canyon in neighbouring Arizona, it’s all too easy to combine the 'Best of the West' in one epic and unforgettable road trip!